These Dr. Seuss baby shower ideas are perfect for either before the baby arrives or after the baby is born. You can decorate your party area in bright blue & red colors (which are also gender neutral) and set out a few Dr. Seuss books from your local library. Here I’ll share ideas with you for baby shower party games. For ideas on food, drinks, decor and more, you can visit this Dr. Seuss Birthday Party post. The party printables featured here are by Just a Little Sparkle. Don’t forget to visit our special Dr. Seuss category for even more fun ideas for parties, crafts, games, food and more! Here is my attempt at rhyming for a sample of invitation wording for a Dr. Seuss themed shower. Anything with rhyming words (especially silly character names) is perfect for a baby shower invitation. If the baby shower is for twins, you can also work Thing 1 and Thing 2 into the party theme. to see those tiny feet! we’ve now set the date! ’cause you won’t want to be late! 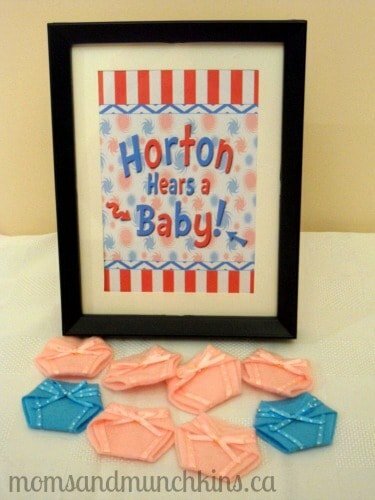 Horton Hears a Baby: This fun game is inspired by the Dr. Seuss book Horton Hears a Who. Simply provide each guest with a small item to pin on their shirts as they arrive to the party (small felt diapers, ribbons, etc.). Once all of the guests arrive, let the guests know that no one can say the word “baby”. If a guest hears another guest say the word “baby”, they have to shout out “Horton Hears a Baby!” and then they get to have the pin of the person who said “baby”. Near the end of the shower, the person with the most ribbons wins a prize. Welcome to Whoville: In the party invitation, ask guests to bring a baby photo of themselves to the party. As guests arrive, lightly tape these photos to a large poster board and number each picture. Guests will then have a chance to look at each of the photos and try to guess who the baby in each photo is. Not all guests may know each other at the party so name tags would be handy for this game. How many silly Dr. Seuss characters can you remember? For more baby shower tips, theme ideas and free printable games, please see our Baby Shower page. Stay updated on the latest baby shower ideas and freebies by following along on Facebook, Twitter, Pinterest and Bloglovin’. *Disclosure: The party printables were provided to me free of charge from Just a Little Sparkle. All of the opinions here are my own. I love this theme!! Where did you get the red forks? Sorry, I don’t see red forks in the Dr. Seuss Baby Shower post. Was it something you saw in the Dr. Seuss Birthday Party post? The ones in the ham? I believe I found those ones at Walmart. They came in a package with 2 colors – white and red.